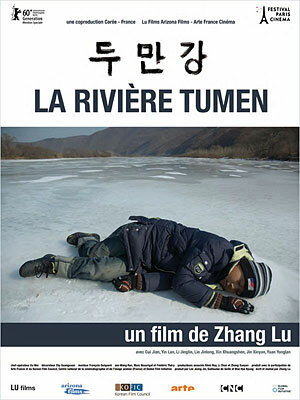 Dooman River (Director: Zhang Lu): The titular river divides North Korea from China, and the film tells the story of the villagers who live on the Chinese side of the border. Chinese-born Koreans like 12-year-old Chang Du have an ambivalent relationship with the North Korean refugees who sneak across the river to beg for food or to try to eke out an existence without being discovered and sent back. Chang Du lives with his grandfather and mute sister, while his mother sends money back from her job in South Korea. His life changes when he meets a boy of his age who has crossed the river in search of food to bring back to his ill sister. The boys bond over a game of soccer and Chang Du invites the other boy back to play for their village team against another village. The bleak winter setting emphasizes the village’s isolation from the rest of China and the villagers’ struggle to get by. Their community exists as a sort of no-mans-land between the two countries, but the presence of armed border guards keeps people on edge. The plot is thin but had potential. Unfortunately, though, Dooman River never rises above the level of ham-fisted political fable. The camerawork is mostly static and each scene feels almost exactly the same length, giving the film the strange rhythm of a slide-show. As well, long stretches had very little happening, but the attempt to tell the story entirely through mood is jarred in several places by melodramatics which left this viewer scratching his head. Strangest of all is the impression the film gives of these issues with the refugees arising just now, when the border has existed for more than fifty years. Villagers act like these refugees have just started appearing in their town a few weeks ago, and their exposition-heavy conversations seem leaden and artificial. Dooman River is playing Wednesday November 10 at 8:30pm at Innis Town Hall as part of the Toronto Reel Asian International Film Festival. Tickets are $12 and are available online and at the door. This entry was posted in Film Festivals, Reel Asian and tagged #reelasian10, china, korea. Bookmark the permalink.